Hello to you all and finely our web site is up and running. We have been looking forward to a summer hollyday filled up with shows in Norway and of course the World Dog Show in Sweeden. Our hollyday started rather turbulent with our car breaking down after just one day on the road. But in all the madness we had luck, the car broke down next to a hotel at Gardermoen and it seem to be ten minutes by car to travel to the show next morning. So we got a good nights sleep and next day Edie become a Norwegean CH. 28 of June we went further to Bjerke Oslo for NKK show. We soon found our friends at Shiny Lake, with them we had a lovely afternoon barbecuing in the sunseth. My daughters companion is eighteen and is an exelent driver so we went for a drive into the senter of Oslo. Show next day went very well for Kaizer and we got to cheer him as he straled aroun in group along with Hilde. But judge did not place him in group this day. We like his good looks and do look forward to next litter in medio august sired by him. Next day we went futher to Sweeden in company with Liv and her son Robin in kennel Adaliro’s and Anita and her husbond from kennel Far North. Firs stop was in Ärjeng in Sweeden at a camp, and we got to streach our legs and give the dogs a good sosialising. People could not help but notecing our beautiful (11 in all) ETT’s. The World Circut Show for Terriers was a big Far North vitory. Con Gratulation to Anita and all her beautiful ETT’s and to Liv in Adaliro as breeder for beautiful Wilma who went ahead and become BIR as junior. Nice work Wilma, we cheer for you. The camp at Älmare Steket was not a sight for Gods. 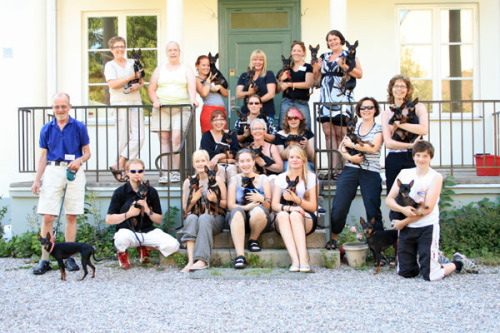 So some of us ETT breeders decided to go to a camp south of Stocholm, Nyneshavn after the Circut Show. A beautiful camp where we stayd for the rest of our stay in Sweeden. Friday was another big happening in the ETT circle in Skandinavia, Annarella Hedberg arranged a gathering for all us ETT lovers. It was a beautiful sunny day when the total of 26 ETT’s where gatherd from Norway, Sweeden, Finland and all the way from England Haydonn Wines was present. Really nice to finely meet Sadies breeder in person. He got along with Sadie very well and got to practise with her for the WDS following day, where he handled her to her Junior World Winner 2008 tittle. THANKS Haydonn, for a beautiful girl and a good job done at the WDS ;-)))) Me bee very happy. Annarella arranged a show for fun and had lots opp other activities going on friday afternoon. Thanks Annarella, will remember this gatering for the rest of my life. So lovely to meet so many ETT people and dogs at the same place. Finaly we had a photo taken of all of us on the front stairs of the house. Some of us was left by the time the photo was taken unforutnatly. But even though a memorie for life. Would also like to Con Gratulate BOB Randallcarr Golden Victory “Kaizer” with his new tittles S UCH and WW 08 ;-)))) and to WW 08, F UCH Khanbull’s Blackberry and JWW 08 Pikiruusun Armas Ottopoika from Finland. And last but not the least Veteran World Winner 08 Twinstripe Alea Jacta Est.